These days, the difference between luxury and mass-market models can sometimes be little more than the badge and the price, which means non-luxury vehicles can be sensational value when compared to similar, more prestigious models. The midsize sedan segment is incredibly competitive right now, and many higher trim levels versions can easily be mistaken for luxury models. Let's take a look at two of the best by comparing the 2017 Ford Fusion vs 2017 Honda Accord, and then we'll know which is the best and how close to a luxury model it is. It's almost unfair to compare the almost fastback exterior styling of the 2017 Ford Fusion with other midsize sedans. The Ford isn't just one of the best-looking models in its class; it's probably one of the most attractive sedans of any type in the current market. The 2017 model has a grille that's now a little wider and sleeker than before, and new LED headlamps complement the existing LED taillamps. The Accord is available in sedan and coupe body styles, and it has to be said the coupe is much more attractive. Even so, they're both a touch safe and conservative, especially when you compare Fusion vs Accord. The Accord isn't unattractive, but it's no match for the Fusion so the first part of this Ford vs Honda battle goes to the Fusion. If the reasonable price of the Fusion has you looking for sub-standard materials like hard plastics, harsh cloth seats and a comparative lack of refinement; don’t bother. There's nothing sub-par about the cabin of the Fusion at all. Getting in and out is easy, there's a good balance of passenger space between the front and rear seats, and there's quality everywhere you look and touch. The Accord's cabin is one of the quietest in the class thanks to active noise control that works excellently to cut out unwanted road and wind noise. And overall, the Accord at all trim levels is nicely fitted out with plenty of space for all passengers. This round has to be declared a tie as they're impossible to separate. There are no less than four-different engines in the Fusion family, which are a 2.5-liter inline-four and three EcoBoost units of 1.5, 2.0 and 2.7-liter displacements, and 175, 181, 245 and 325 horsepower, respectively. The best fuel economy comes from the 181 horsepower 1.5-liter EcoBoost at 23 mpg in the city, 34 mpg on the highway and 27 mpg combined. The standard engine in most Accord is a 185 horsepower 2.4-liter four-cylinder, but there's also a 278 horsepower 3.5-liter V-6 available for select models. Four cylinder examples with CVT transmissions are good for 27 mpg in the city, 36 mpg on the highway and 30 combined, so this round is a good win for the Honda. It's hard to criticize a car as enduringly successful and popular as the 2017 Honda Accord, but when you’re comparing it to the Ford Fusion there's really no need to criticize. There's nothing wrong with the Honda at all, it's just the 2017 Ford Fusion is almost impossible to beat in this class right now. 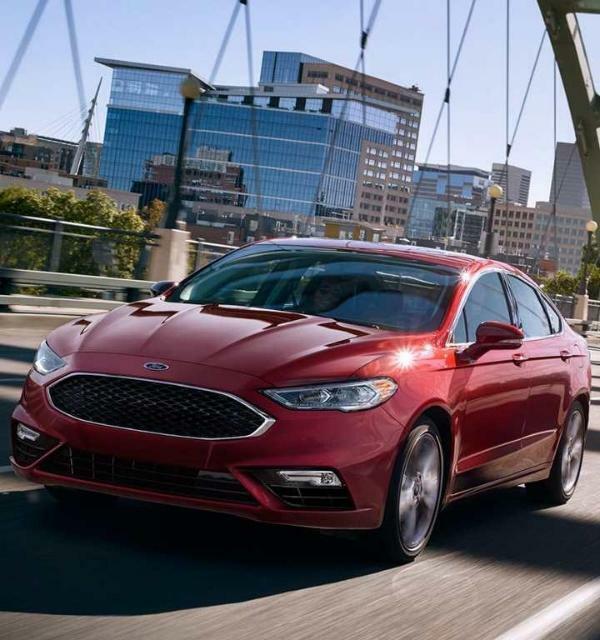 For more information about the Fusion and to schedule a test drive, don’t hesitate to get in touch with us here at Southern California Ford Dealers.